Take an interest in the future. You will spend the rest of your life there. Effective and convenient one-on-one tutoring in all areas of English, including test prep and essay writing. I am a Connecticut-certified English teacher (grades 7-12) with a Masters in Education and an Ivy League graduate. I have a strong background in writing and literary analysis, SAT/ACT/AP (Lit/Lang) prep, ten years teaching at the high school level, and seven years tutoring as well as conducting writing workshops for adults. I have successfully worked with students in 4th grade up through those who are working on their masters and PhDs. I have become thoroughly familiar with the NEW SAT Reading and Writing tests. I have developed a course for the new SAT essay portion. Although as of 2016 the essay will be optional, it is highly recommended for students wishing to apply to more competitive schools to complete the SAT essay. I received an ETS Recognition of Excellence for my performance on the Praxis II English Language, Literature, and Composition: Content Knowledge, a required test for certification in Connecticut. I received my B. A. in English from Cornell University and my M.Ed. from the University of Bridgeport, CT. I develop a friendly rapport with my students, regardless of their age or needs, in order to create an atmosphere that is comfortable, encouraging, and motivating. My approach is to pinpoint my students' areas of weakness and devise a plan that is tailored to their specific needs. I then work extensively with my students so that they can make great improvements and are no longer intimidated by their area of need, whether it is in the writing process, test-taking strategies, vocabulary, or grammar. On average students I have worked with on SAT Reading and Writing prep have gained 50-100 points per section. See Rates & Policies for more information. As a professional writer, I also am an excellent editor. I am a national award-winning, produced and published playwright. My co-written play Killing Dante is published by Samuel French. My features, news articles, biographical backgrounds, and film and theatre reviews have appeared in such publications such as Connecticut Magazine, The Litchfield County Times, Prestwick House, The Newtown Bee, The Antiques and Arts Weekly, and Voices. Shannon is an excellent tutor. She has a very calm and patient style of teaching. She connected well with my son and he enjoys working with her. Shannon was able to quickly identify my son's specific areas of weakness in his SAT testing. They are now focusing on these areas (reading and writing) in an effort to improve his future score. I have the utmost confidence that this will occur. 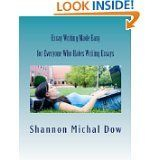 I recommend Shannon highly and without hesitation. She is very professional, charming, and prompt. There's nothing more you can ask for in a tutor. Our first lesson was wonderful - filled with things I did not know that will help raise my numbers on the SAT and ACT exams.